Soothing spa music floats through the air as my massage therapist’s hands knead deep into my back. My skin is tingling from all the raw shea butter that’s been worked into it over the past half hour. My worries fade with every squeeze of my shoulders—and then the wood floor of my 118-year-old house creaks as one of my roommates walks by the massage table set up in our living room. 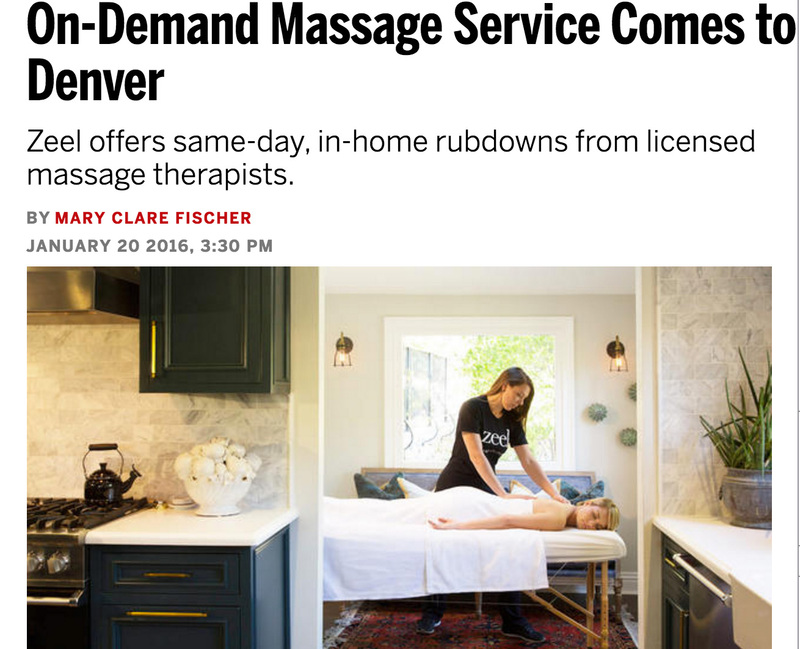 This is one of the pitfalls of using Zeel, an in-home service that functions as “Uber for massage.” The concept sounds great: You download the Zeel app on your Android or iPhone (or log on to zeel.com), choose your type of massage (Swedish, deep tissue, prenatal, etc.) and the duration of the session, and a licensed, vetted massage therapist shows up at your house that same day—or really, whenever you’re available between the hours of 8 a.m. and 10:30 p.m. You can specify your preference for your therapist’s gender and write down notes about allergies or injuries. There’s even questions about whether your home has stairs, you own pets, or if you already have a massage table. That thoroughness is impressive, and it’s not surprising that Zeel has expanded to 12 cities and regions—including Chicago, Boston, Washington, D.C., and just last month, Denver—since launching in the New York City metro area in February 2013. Aspects that seem a bit strange at first, i.e. you’re required to provide your social security number and need to supply sheets and a pillowcase, can be easily explained. (1. Zeel wants to protect its therapists and you; and 2. clients are often more comfortable using their own sheets versus a stranger's.) Most of the problems stem from the factors that you as the client don’t normally need to consider when you head to a spa for a massage. I live in Capitol Hill, where parking for a vehicle large enough to hold a massage table is, well, scarce. The only room big enough to set up the table in my narrow apartment also has large windows that don’t lend much of a dark, calming atmosphere to the space. And I should have planned better to ensure my roommates weren’t making enough noise, even accidentally, to interrupt my Zen. Because otherwise, the quality of my service nearly matched that of the big-box massages I’ve received. My therapist was a Navy veteran who had started providing rubdowns to injured soldiers before surgery to calm their nerves (and muscles) more than 30 years ago. His expertise showed in everything from the level of pressure to his use of that lovely shea butter. It was well worth the $105.02, which included an automatic 18 percent tip for my therapist. (For a 90-minute session, you’ll pay $152.22, including tip). To save some money, you can sign up for a 90-day trial of Massage Zeelot, Zeel’s subscription service, which knocks 17 percent off the price of a monthly massage and comes with a free massage table. If you enroll before the end of the month, you’ll also receive free Zeel-branded sheets and an extra $25 credit in your account. Just make sure your hubby and kids know to stay away for that blissful hour each month.